Abstract: Zeke is an older dog with a history of hind limb lameness and stiffness. After initial diagnostics were performed, a tentative diagnosis of hip dysplasia was made. The owner was not interested in starting any pharmaceutical treatment until we had pursued acupuncture and laser therapy. This was a unique case that solidified to me that acupuncture and laser therapy can be just as successful, if not more successful, than pharmaceutical treatment (tramadol, non-steroidal anti-inflammatories (NSAIDs), gabapentin, corticosteroids, etc). The results after just a few acupuncture sessions were outstanding; after the third treatment the patient no longer had any lameness and the owner was very happy with the progress Zeke had made. Zeke is an 8 year old male neutered mixed breed dog, weighing about 100 lbs. He is a regular patient of the clinic for his usual wellness check ups. Aside from being overweight, he has been a healthy dog with no underlying conditions or past medical concerns. He has an exam, routine blood work, and a dental cleaning performed yearly. He is not on any medications other than a glucosamine joint supplement. Zeke is a moderately active dog. He goes for a daily walk and has a dog sibling at home that he plays with routinely. Zeke first presented to me for acupuncture due to stiffness and an ongoing lameness of the right hind leg, present for the last few months and gradually worsening. According to his owner, Zeke was the most lame in the morning or after a long walk. The lameness was noticeable at a walk, but it did not stop Zeke from running or playing. He would occasionally hold up the right hind leg as well. The owner was aware Zeke was overweight and had decreased his caloric intake and increased exercise but that was difficult due to his lameness. On initial exam of Zeke, his vitals were within normal limits, his body condition score (BCS) was 7/9. Zeke was moderately lame on the right hind limb at the walk and trot, notably hiking the right hip, avoiding flexion of the distal joints. He was aversive when palpating the hip joints. He fully guarded the right hindlimb from full limb extension. Extension of the left hind limb was possible but appeared painful for the patient. No medial buttress, crepitus, or cranial drawer were noted on either hind limb. Conscious proprioceptive placing reflexes were within normal limits on all limbs. Overall no neurologic deficits were noted. The forelimbs had adequate range of motion and no pain on flexion or extension. Zeke had notable myofascial restriction over the lumbosacral spine and hips, a taut band on the dorsum between the scapulae, and trigger points at BL 21, BL 23, and BL 25 bilaterally. The following week, sedated lumbar spine, hip, and stifle radiographs were obtained with minimal significant findings although they were not evaluated by a radiologist (offered to the owner and declined). Zeke had no notable radiographic signs of arthritis in the hips or the stifles, which surprised me given his exam and clinical signs. There was mild narrowing of the intervertebral space between the lumbar vertebra L4 and L5 noted by a traveling orthopedic surgeon who reviewed the radiographs at a later date. A thyroid hormone (T4) was checked this day as well and was within normal limits. I suspect Zeke may have multiple pathologies. Given the breed, BCS, difficulty with hip extension, and character of the lameness, I suspect that the patient has mild hip dysplasia that was not appreciated on the radiographs. Zeke may also have secondary hip osteoarthritis relating to the dysplasia that is not radiographically evident yet. The narrowing of the vertebral space between L4-L5 is subtle and may be inaccurate, but it could be suggestive of mild intervertebral disk disease (IVDD) in this area. To confirm that diagnosis, advanced imaging (CT/MRI) would be necessary and is not an option for this patient. Both of these tentative diagnoses have likely caused secondary myofascial strain and dysfunction. Given the patient’s minimal radiographic findings and great response to alternative therapies, it is possible most of his symptoms are caused by compensatory pain. Zeke likely has his taut banding between the scapulae due to weight shifting to the forelimbs from hip dysfunction. The paraspinal trigger points along the inner Bladder line may be related to muscle tension from potential disk disease. -Inflammatory: Repetitive strain injury, prostatic disease. -Auto-immune: Immune mediated polyarthritis, systemic lupus. -Congenital: Poor conformation causing secondary musculoskeletal strain. -Infectious: Discospondylitis- no radiographic signs, no systemic signs (fever). -Neoplastic: No radiographic signs of neoplasia but cannot definitively rule out a spinal cord tumor, peripheral nerve sheath tumor, etc. without MRI. -Degenerative: Intervertebral disk disease (IVDD), lumbosacral disease, degenerative myelopathy, cranial cruciate ligament or other ligament degeneration/tear. -Traumatic: Soft tissue injury, strain or sprain. -Myofascial: Strain injury, myofascial restriction. I used the MAIN technique when formulating my therapy plans for Zeke. Myofascially, I wanted to address his trigger points paraspinally between T13 and L5 as well as taut banding between the scapulae. He also has severe myofascial restriction over the lumbosacral area. To affect the autonomic nervous system, I typically choose ST 36, Bai Hui, GV 20, and GV 14. I also target peripheral points during each session, such as ST 36 or BL 60. Central nervous system stimulation is crucial to my neuromodulation plan for Zeke. I target the inner Bladder line, especially between L4-S2 to address the hips centrally by stimulating the nerve roots for the femoral and sciatic nerves. L2-L4 is the nerve root origin of the femoral nerve so stimulation here secondarily modulates the iliopsoas muscle which may be playing a role in Zeke’s presentation. So far, I have performed four acupuncture treatments on Zeke. I started with one treatment per week for the first four treatments and we are currently extending to a treatment every two weeks since Zeke is doing so well. My plan is to continue to extend time between each treatment until we find the appropriate length of time that can pass without him having a return of symptoms. -GV 20 and GV 14-Dry needling. I typically start with these points with each treatment for Zeke. He is usually very excited at the beginning of the exam and I have found that when I start with these two points, he becomes relaxed and lays in lateral for the rest of the needling without the need for any restraint or food rewards. As mentioned previously, these points are part of the MAIN technique to neuromodulate the autonomic nervous system to decrease overall inflammation and pain. -SI 11, SI 12, GB 21- Dry needling. Zeke tolerates dry needles in these areas very well and I place them bilaterally in order to address compensatory forelimb pain and myofascial dysfunction from weight shifting off the hind limbs by neuromodulating the suprascapular nerve and spinal accessory nerve. -BL 11, BL 12, BL 13, BL 14- Dry needling. Zeke typically has a large taut band present in this area, spanning between the shoulder blades. I suspect this is secondary from weight shifting to avoid loading the lumbar spine and hips. -BL21, BL 23- These points are used to dry needle paraspinal trigger points as well as for their help with lumbar pain. -BL 25, BL 27, BL 28- Dry needling these points is both to address myofascial restriction in the area and to centrally affect the nerve roots in these areas (L5-S2) that modulate the hip. -Bai Hui- I use this every session to increase parasympathetic tone and to treat lumbosacral pain and pelvic limb dysfunction. I dry needle this point as well as use it with electrical stimulation. -ST 36- I use this point for it’s parasympathomimetic ability to decrease overall inflammation, as a peripheral point, and to treat pelvic limb dysfunction. I typically just dry needle this point. -Hip triad bilaterally- GB 29, GB 30, BL 54- These are used every appointment to stimulate neuromodulation of the hip by affecting the sciatic nerve and cranial gluteal nerve and to treat hip pain. I dry needle these points and use them with electrical stimulation. I also needle GB 31 as a good distal point for my E-stim (femoral and sciatic nn.). -BL 60- I dry needle this point as a peripheral point to treat hind limb pain and stimulate the fibular and tibial nerves. I typically have Zeke lay in lateral and dry needle down one side of the body, then run electrical stimulation while most needles are still in. I try to leave the E-stim running for at least 5 minutes if the patient is tolerating it. I then remove all my needles and have Zeke lay on his other side. I place GV 14 and GV 20 again, then continue down the body with dry needling on this side, followed by electrical stimulation. Extra point placement is guided by my myofascial exam and I will dry needle any additional trigger points that I find that day. I finish each session with a laser treatment, followed by a brief massage to evaluate the myofascial response to the treatment. For all points on Zeke I use Seirin J type needles, No.3 (0.20) x 30 mm. Zeke tolerates the 0.20 mm needles well and this allows me to use electrical stimulation after placing the needles. The only points that I use smaller needles (Seirin J type No. 1 (0.16) x 30 mm) for are ST 36 and BL 60 bilaterally. I have used electrical stimulation on Zeke every session except our first. I use an ITO ES-130 three channel unit but I typically only hook up two channels at once. My first channel is Bai Hui to BL 54 and the second channel is usually GB 30 to GB 31. I have also used E-stim on the patient from BL 23- BL 25 or other inner BL points that seem painful that day. I use the unit on a low frequency, typically delivering about 1.3-2.5 Hz. As mentioned before, I leave the electrical stimulation units running for about 5 minutes. I laser Zeke at the end of the treatment, going over the whole spine and the hips, with a heavy focus on ST 36. I use an Erchonia PL 5000 variable frequency cold laser (Class 2, 5 mW). The wavelength is 635 nm, red light. I use pre established settings for inflammation and spinal cord pain. The inflammation and pain setting delivers frequencies of 9, 16, 42, and 53 Hz/s and the spinal setting delivers 151, 1151, 1260, 1550 Hz/s according to the handbook that comes with the device. Each session is programmed for 180 seconds. I do two to three sessions. A big reason why I chose this case for my report is the incredible response to acupuncture and laser treatment. The owner was adamant about trying acupuncture prior to starting any medications and that has helped me really understand if my treatment protocol is working or not. There was no immediate improvement after the first acupuncture session. The second session was when the patient was sedated. He stopped limping for two days after the sedation and then started limping again. After the third week, the owner noticed a large improvement. She stated to me at our fourth appointment that she couldn’t remember the last time she noticed the limp and that Zeke is less stiff in the mornings. With the added mobility and less pain, he has been able to walk longer and has lost a few pounds (last weight was down to 97 lbs!). It is obvious to me that acupuncture and laser have helped this patient as no pharmaceutical or environmental changes were made. As I have been writing this report, it has made me rethink the case in detail and that will likely affect my future treatments for this patient and future patients. In the past, with a patient with the same presentation, I would typically discuss lifelong NSAIDs, possibly tramadol, etc. 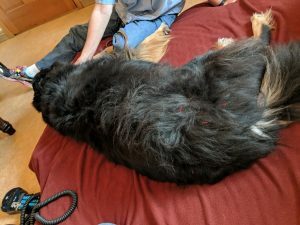 Zeke’s progress without any prescription drug intervention has completely changed my view on the power of acupuncture and will affect how I present options for therapy in the future. A study challenging owners to characterize their dog’s hip dysplasia pain after acupuncture versus carprofen suggested that acupuncture patients’ pain was resolved for up to two weeks (1). By using acupuncture to neuromodulate the central, peripheral, and autonomic nervous systems, we can help many future patients with their pain without reaching for the NSAIDs or other drugs and their accompanying side effects. 1. Teixeira LR, Luna SPL, Matsubara LM, et al. Owner assessment of chronic pain intensity and results of gait analysis of dogs with hip dysplasia treated with acupuncture. J Am Vet Med Assoc. 2016;249:1031–1039. 2. Silva NEOF, Luna SPL, Joaquim JGF, Coutinho HD, Possebon FS. Effect of acupuncture on pain and quality of life in canine neurological and musculoskeletal diseases. The Canadian Veterinary Journal. 2017;58(9):941-951.